If you’ve ever lightened your hair by any method, you know that sometimes it doesn’t turn out exactly like you want it. Sometimes the hair color you get is not ideal. That’s where a toner comes in! In our toners buying guide, we’ll take a look at products that take the brassy and yellow tones out of bleached or blonde hair to leave you with gorgeous locks! First, let’s take a look at some of the things you should know. Type: What type of product is it? Toners can come in many forms, from shampoos to creams that you allow to sit in your hair and then rinse out, commonly called hair masks. Masks are sometimes more effective. Hair Color: What color are the toners aiming to fix? Most likely this is some shade of blonde, or just blonde in general since they are commonly used to treat bleached or lightened hair. This is important for determining which to get. Paraben-Free: Parabens are a type of chemical added to some cosmetic and healthcare products that are supposed to act as preservatives. They’re actually not very good for you, so paraben-free products are just better for you in general. 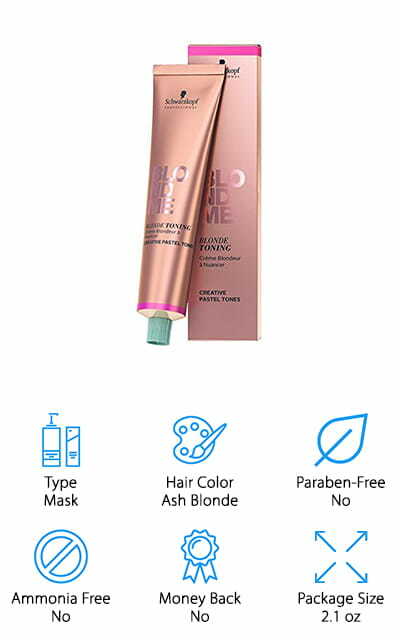 Ammonia Free: Ammonia free dyes and toners won’t have a strong smell as they’re being applied, but they might actually be less effective because of the way that the ammonia helps to bind color to your hair. Weight the benefits! Money Back Guarantee: Some toners come with a guarantee that you’re going to love it. If you don’t, they’ll send your money back as long as it’s within a certain amount of time. It’s a risk-free trial run! Package Size: How much are you getting? If you have a lot of hair, you might want to go with a larger amount of product, because you’re going to be using more of it regularly than someone with shorter hair. Now that you know all about toners for brassy hair, we can show you the toners reviews! Each of these products was researched and reviewed in order to bring you only the best products to browse. They’re all great, but the top pick and the budget pick we’ve presented are the absolute best. Without waiting any longer to get your hair looking great, let’s get started! This purple toner for brassy hair will get your hair looking fabulous! The deep purple formula works to remove the brassy or yellow undertones from your blonde hair to make it look great again. It’s full of coconut oil, which works to improve the strength of your hair. This is especially important if your hair has been bleached. It adds shine and moisture to hair that might be damaged or fried from bleaching or frequent coloring. 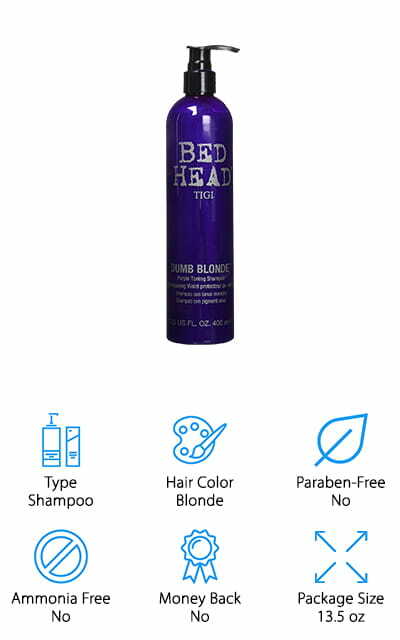 They recommend that you use it once a week or as you feel you need it to keep those brassy tones away and the natural beauty of your hair color or highlights glowing! Leaving this in for five minutes is an effective way to get your highlights, platinum, or silver hair looking revitalized. It’s free of a lot of the parabens and sulfates that most don’t want in their hair products. We love that it helps to repair your hair as well! Our choice for the best cheap toner is this Wella toner for brassy hair. It’s a cream that you apply to every inch of your hair and leaves for about fifteen minutes. When that time is up, rinse it out and you’ll be left with a perfect blonde or silver tone. In this case, it’s a light ash blonde that they’re looking for, though there are many other shades you could buy in this particular product. It helps to neutralize any yellow or brassy tones after bleaching or otherwise lightening your hair. That way you get the hair color you really wanted, even after dyeing mistakes. It also helps to cover grays and moisturize your hair while it works. And it’s fade resistant on top of that, so it will last for a long time without having to reapply and restore your hair. 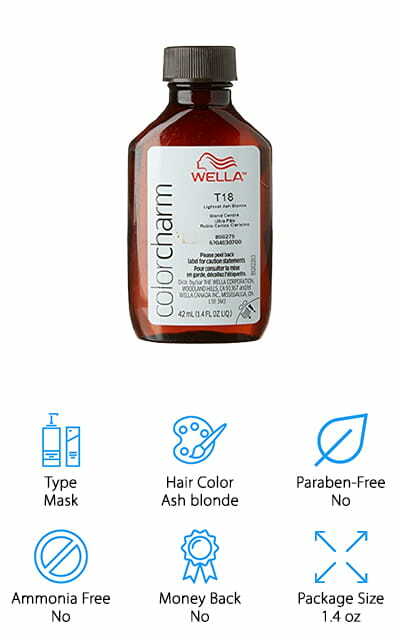 Get that vibrant color without the hassle with this toner from Wella. This purple and blue toner for brassy hair will effectively take all the yellow, orange, brassy tones out of your blonde hair. It’s the first shampoo on our list, which means that you can use it on dry or wet hair depending on how effective you want to be. Plenty of people recommend putting it on dry hair for the best results, but you can also use it wet in the shower and still get a result. It’s meant to control frizz, keep static under control and stop flyaway hairs with just one application, as well as keeping your cool colors chilly and reducing the warm brassy tones that you don’t want. The mixture itself is as bluish purple, perfect for binding to those unwanted colors. We love that it washes your hair at the same time the toner is working. And having it specifically aimed towards blonde hair certainly helps you achieve the perfect color that you want. 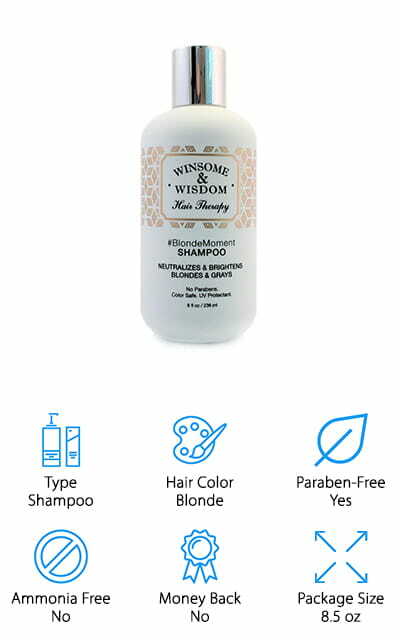 Blonde Moment by Winsome and Wisdom is one of the best toners for brassy hair. 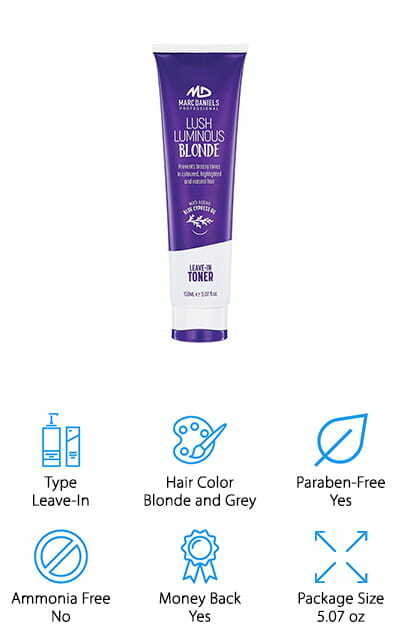 It’s a purple toner that you work through your hair, either wet or dry, in order to neutralize the yellow and brassy shades of blonde and bring out the classic color that you want. It helps to brighten the colors that you do want to see and get rid of the tones that you don’t. It includes Mica so it’s effective as a shampoo, so you can get your hair color controlled and washed at the same time. It’s safe for chemically-treated hair, such as hair that’s been bleached or dyed, so you don’t have to be a natural blonde to use it. It’s paraben-free and will protect your locks from harmful UV rays as well! It doesn’t get much better than this fantastic product. It’s definitely one of the best toners for sale, and it does the job well while smelling fabulous! This ash toner for brassy hair by Schwarzkopf is a great alternative to some of the more purple or blue masks and shampoos. It’s a lighter color, so it’s perfect for getting that ashy, pale color that you want without ending up with randomly colored purple and blue spots. 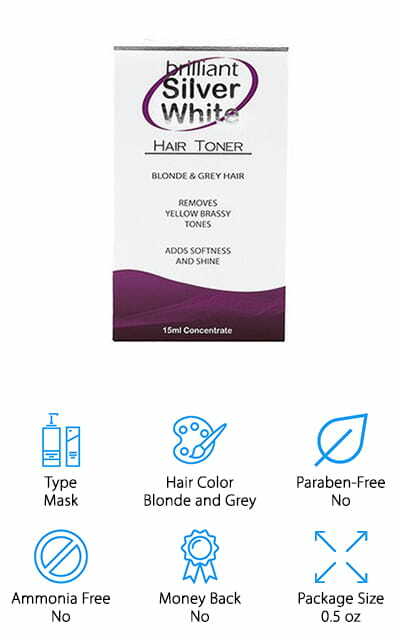 When you’ve bleached your hair completely out down to a grey or white platinum color, this is the toner that you’re going to want to use to avoid any blunders that might make it worse! 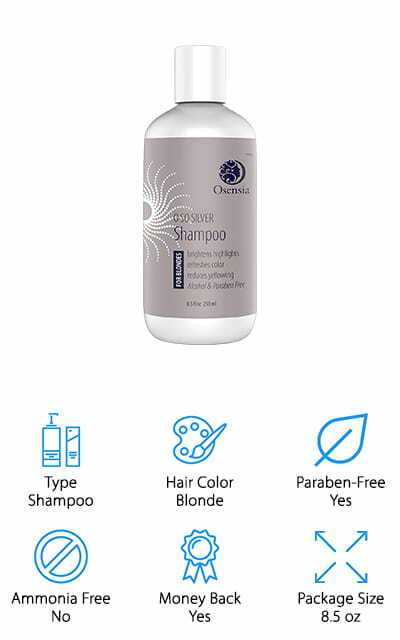 What we found unique about this product is that the company actually recommends trying out more than one shade of their blonde toner in order to achieve different shades and tones. It’s one of the best ash toners for brassy hair on its own, not to mention the unique looks you could create! Osensia makes the best professional toner for brassy hair we’ve seen on our list yet. This particular shampoo is great for bringing out the silvery tones of your hair while leaving the yellows and brass colors behind. It helps to neutralize and balance color while also moisturizing and conditioning your hair, so it feels a little less dry. This can sometimes happen if you’ve bleached it or lightened it in some way and naturally happens as our hair ages. Use it with the purple conditioner they also make for shiny hair that you won’t want to stop running your fingers through. There are no alcohols, parabens, or silicones either, so you can be sure that you’re getting the best hair care experience without sacrificing quality or using harsh chemicals. It’s effective for all blondes and safe for color-treated hair. You want your highlighted, blonde, or silvery hair to shine, so get your hands on this product! Marc Daniels makes this excellent toner for blonde, grey, and color-treated hair. Don’t overthink it – neutralize those brassy yellows and oranges that you don’t want in your hair with a toner that will moisturize and nourish your hair while it deposits color. It has a pleasant scent that is light and not overpowering at all. This is a great non-oily, non-greasy formula that will restore and renew your hair with a single application. Get the smooth, perfectly-colored hair that you’ve always wanted with this leave-in toner. You don’t have to wash it out right away like a perfume, but rather leave it in for a set amount of time and then rinse it out for the best results. It will leave your hair feeling soft and smelling good, and you’ll love the way it looks as well! There’s also a 100% satisfaction guarantee, so what do you have to lose? We know you’ll love it! 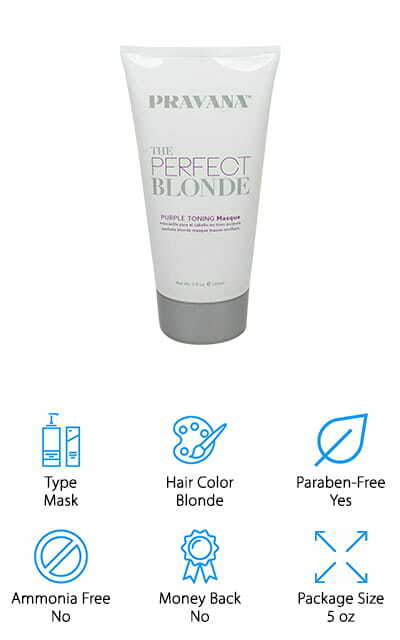 This blond brilliance toner is formulated specifically for platinum hair, so you know that it’s going to get those lighter shades of white and blonde that much more brilliant. It might be one of the best hair toners for brassy hair because instead of being a color-correcting purple or blue, or even green, it’s a permanent white-based toner that won’t leave your lighter shades looking tinted. It’s free of any sort of ammonia, but this powerful formula doesn’t let that slow it down. Apply and leave in for 5 to 15 minutes and you’ll be able to see the difference right away. Then just use it as needed to maintain a beautiful color! It contains natural ingredients like acai and papaya to keep your hair moisturized and looking amazing. It also contains coconut oil, which helps your hair stay so much more touchable even after being fried. We love how much it nourishes your hair! This amazing toner by Brilliant Silver White is meant for light silvers and white colors. It’s a blue toner for brassy hair, but you have to make sure that you’re using a small amount. 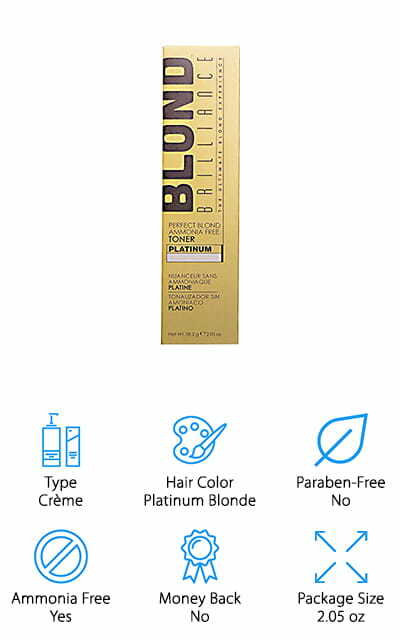 It’s super concentrated and on lighter shades, it might add a blue tint to your hair if you use too much! Always be mindful of how much the instructions say to use. This product is certified by PETA, it’s Vegan and cruelty-free as well if that’s something that is important to you. While it’s at work in your hair removing the brassy tones, it’s also adding a softness and shine that will make you love your color! It’s great for all different hair types, even chemically treated or colored hair. It’s nonmetallic as well, so you don’t have to worry about that. Reapply after every 5-8 washes for the best results. Use a few drops at a time and see how much your hair shines! Some people may prefer a green toner for brassy hair, but that isn’t the case with this Color Mask conditioner. While this does improve the tone of your hair, it’s mostly a product meant to boost and refresh the color of your hair dye between visits to the salon. It lightly tones the colors to balance them out and results in brighter sections of light hair. 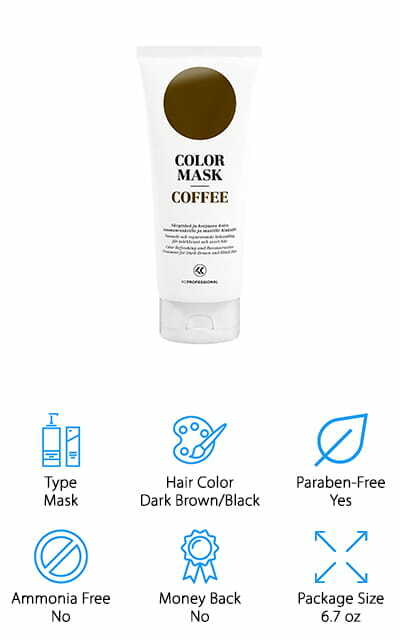 This particular one is used for dark brown or black hair to maintain that color, but there are sixteen different shades so you’re sure to find the one that will match your color. If not, you can mix them together to create a more unique boost to your color. It also helps to restore your hair and help with damage, keeping your hair strong and shining and beautiful! It’s paraben and cruelty-free. Remember to wear gloves with darker shades as it will stain your hands and it’s hard to wash off your skin.